8 piano sounds you can choose from. Kawai Musical Instruments Manufacturing Co. Ltd is recognized globally for its high quality top-of-the-line musical instruments such as grand pianos, upright pianos, electronic keyboards as well as electronic synthesizers. The company was established in 1927 by its founder Koichi Kawai, who was a gifted inventor with a passion for creating pianos. Close to a century later, the Kawai name is still a force to recon with. Like all great brands, the company faces stiff competition from companies with equally rich heritage such as Yamaha and Casio. It would surprise some that in his youthful days, Mr. Kawai once worked for Yamaha in research and development. 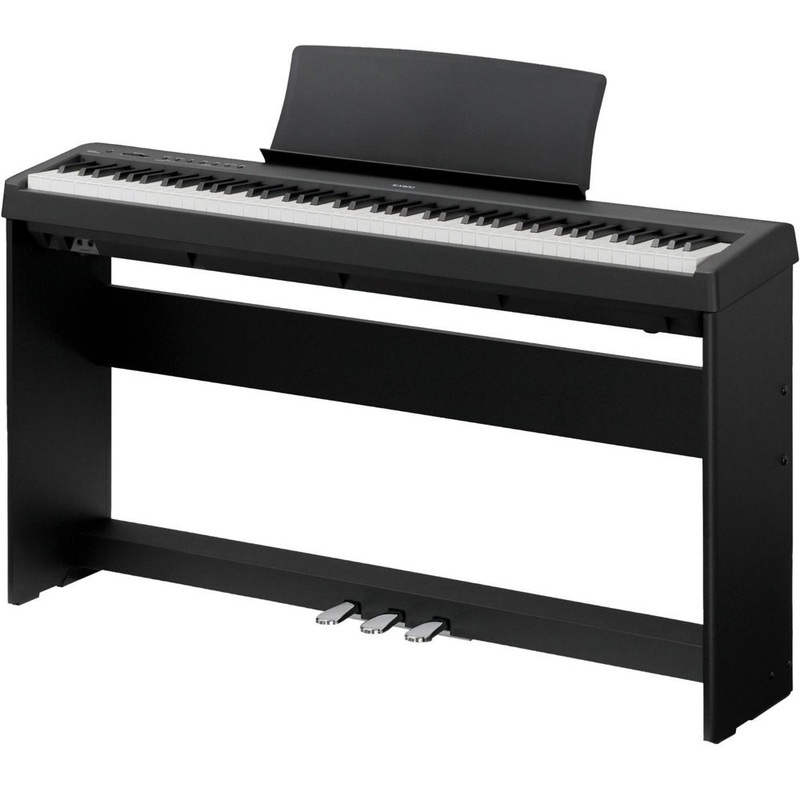 It is therefore interesting to see how one of Kawai’s best-selling digital pianos, the Kawai ES110 Digital Piano, fares against the competition in terms of key features, price and portability. First of all, Kawai ES110 digital piano is designed to be as portable as possible. With a remarkable weight of only 26 lbs, it is perfect for the gigging musician who’s constantly travelling, or it can be installed permanently at home with its stand and pedal board, as a practice piano. Its portability comes at a price though as it looks a bit plasticky with limitations in terms of features such as the lack of a screen, However, its light weight gives it an edge over its competitors such as the Roland FP30 weighing almost 40 lbs. The keys are also quite responsive thanks to the sensor being located around the middle of the key rather than its tip. The result is a faster key-playing response than more springier keyboards in its price range. The weight and feel of the keys is akin to being in control of a more expensive musical instrument. The ES 110 is also equipped with Bluetooth 4.0 through which the keyboard can connect wireless to iOS or Android tablet. This allows you to tinker with the sounds to your satisfaction. One of the most important aspects of any musical instrument is how it sounds, of course. The ES110 will not exactly blow you away with the sound but it’s decent and clean enough to actually make it enjoyable. There are eight piano sounds to chose from, namely: Concert Grand, Concert Grand 2, Studio Grand, Studio Grand 2, Mellow Grand, Mellow Grand 2, Modern Piano and Rock piano. Each mode is uniquely suitable for particular situations due to the frequencies that they are able to generate. For instance, the Concert Grand 1 can cut through the hum of conversation without being intrusive. The Kawai ES110 Digital Piano does have some shortcomings. For instance, the user interface is at best basic. With the lack of a digital display, its difficult to move through the different modes available with a certain amount of certainty. To access the Rock piano for example, you have to press the PIANO key 8 times. One key extra or less could land you in the wrong mode. Additionally, the stand looks a bit flimsy without much effort being put into converting it into a more standard piece of furniture. The Kawai ES110 gives great value for money. It is suitable for gigging musicians and anyone who would like to practice piano at home. Its light which makes it very portable. The lack of a digital screen as well as the flimsy looking stand may be a turn off for some people but the solid build plus array of features on offer makes it a worthy buy.